Kesar Badam Milk / Saffron flavored Almond Milk. A rich concoction of almonds, milk and sugar with saffron and cardamom flavoring, Badam Milk/Almond Milk is a pure classic Indian beverage. Ground almonds cooked with milk and sugar brings back memories of a favorite drink during my school days. Kids will sure like this combination mixed up and served chilled in a glass. Soak the saffron in warm milk for about 1/2 hour to an hour. Soak almonds in hot water for 15 minutes, wash and drain and repeat the process until the pink color leaves. Then peel the skin and grind the almonds to a paste adding one cup of milk. Bring the remaining cup of milk, sugar, almond paste and evaporated milk to a boil. Keep stirring once in a while to ensure lumps are not formed and they do not burn because they tend to stick to the bottom and form lumps. Finally add the cardamom powder and saffron, stir well.Turn off heat. Garnish with slivered almonds or pistachios and serve chilled. Tips: Add sugar according to your choice. Typically the badam milk has a little extra dose of cardamom flavoring, increase or decrease to your choice. I have used evaporated milk, if you do not find one then boil about 3 cups of milk and simmer until it reduces to one cup. For cardamom powder: In a mixer grind 1/2 cup of cardamom with 2 teaspoon sugar and store in an airtight container. I always end up making badam kheer in festival time. Evaporated milk- I got to try next time! It is glorious this snap! Looks absolutely delicious. Got to make some. I am not a milk fan, but this i would slurp it up in seconds. A refreshing and a healthy drink.You have a nice blog and u can visit my blog and give ur comments. Love almond flavored drink, new recipe with evoparated milk.Beautiful pic. Oh my, that badam milk sounds so sinfully delicious! One of my favorites! Wow, that is a nice one. I am going to make it soon. Such a awesome drink..looks fantastic! Amazing drink. wanna have it now. This is my favorite too. Sometimes I use MTR's Badam Feast if I want this in a jiffy, but it cannot definitely compete with the fresh homemade drink. Looks so creamy n delish! ohh such beautiful snap!! And an amazing drink too..I am not a great fan of milk but milk like this..will finish in seconds..truly rich! Photo parkkum pothu 2 glass madakku madakku innu kudikkanum pol irukirathu,Romba super. I am following your blog regularly and I find your recipes very very useful. Thank you soo much. 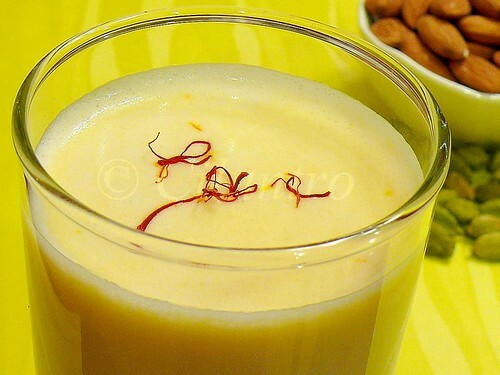 The kesar badam milk looks healthy and refreshing. Hi.. nice posts.. I like ur blog.. Hope u will visit my blog too..
looks delicious and the pic is so gorgeous. Hi Cilantro, I was not feeling well, so I couldn't get back to you immediately. I too felt that the frosting was very sweet. While I was going through recipe sites like recipezaar, allrecipes, for the vegan version of buttercream frosting, I too saw comments from various people that they felt it was very sweet and reduced the quantity of sugar by 1 cup. I too did that, instead of 4 cups of sugar I used 3 cups and I don't know how or why it did not affect the texture. I did this for the first class itself because the cake I baked came out very sweet, so I was forced to reduce te quantity of sugar. In fact my instructor told me that my stiff consistency was so good inspite of less sugar and no meringue powder. For some cakes I reduced the quantity of sugar in the cake and kept 4 cups for the frosting. Beautiful color. It has been ages since i made this.I use the MTR powder for making this. Looks really yummy and tempting...want to try some soon..